A bearing is a component used to decreasing of friction which could be caused from any elements related rotation, in order to reach the maximum efficiency of the power, which could have been converted from torque power into heat power, so the main function for the bearings is decreasing the "converted to heat" power. A great variety of roller bearing types and designs are known, the manifolds of the bearings is justified by their various purpose of application. This is the smaller of the two bearing rings and gets its name from the position it holds. It has a groove on its outside diameter to form a path for the balls. The surface of this path is precision finished to extremely tight tolerances and is honed to a very smooth, mirror-like surface finish. The inner ring is mounted on the shaft and is usually the rotating element. This is the larger of the two rings and, like its counterpart the inner ring, its name is derived from the position it holds. Conversely, there is a groove on its inside diameter to form a pathway for the balls. This surface also has the same high precision finish of the inner ring. The outer ring is normally placed into a housing and is usually held stationery. (1 micro inch = 1/1,000,000th, or one-millionth of an inch). Rolling elements can be either Balls, Cylindrical Rollers, Spherical Rollers, Tapered Rollers and Oil in case of Journal type of Bearings. The main purpose of the cage is to separate the balls, maintaining an even and consistent spacing, to accurately guide the balls in the paths, or raceways, during rotation, and to prevent the balls from falling out. Cage may be of Steel, Brass, Bronze, or Phenolic composition, depending upon the type and application of the bearings. 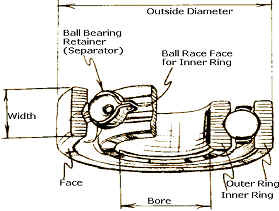 The parts of a Bearing in general is illustrated in the figure. Low Friction--Particularly low starting friction. The ability to support both radial and thrust load and high speeds of rotation. Accurate performance under changing load and speed. Operating ability under extreme conditions of speed and performance. Practically no wear in running. The above advantages clearly justify the ubiquitous presence of Bearings in our life.